Last summer I was lucky enough to review Dora’s first novel Journey’s End. I enjoyed it so much I asked her to remember me when the next book in the series came out, and I’m so glad she did. 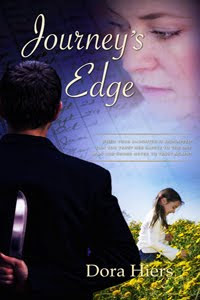 I had the distinct pleasure, joy, fun…(insert any happy word here)…of reading Journey’s Edge last month, and today it finally releases—making it the perfect book to share on this Bookshelf Friday! In this sequel you get reacquainted with Renner Crossman, and we hear his story. Renner is a new Christian, who realizes he messed up in the past with the one woman he cannot get out of his mind or heart—McKinley (Kinny) Frasier. When he finds he’ll be in the same town as her for a night, he asks if they can meet, only to discover she’s in danger. Renner steps up to help her out—and win back her trust—as they battle the man who’s after Kinny and her daughter. The pace of this story was perfect for me. Renner didn’t push for Kinny’s trust, he earned it back. It wasn’t always easy, yet those were the moments Renner’s trust in God grew. And I think that’s one of the reasons I love Dora’s writing style. She doesn’t do ‘easy’ for her characters. Things don’t always go quite like you’d expect, and yet we still get our Happily Ever Afters—a ***sigh***worthy mix. Journey’s Edge delivered all those sighs with a healthy dose of suspense—which I love—and a lot of laughs. Renner and Kinny, while battling some old hurts, still found time to tease each other. It’s another element I love from Dora’s writing. She balances the heavy, suspenseful moments with fun, and she does it well. If you haven’t read Journey’s End, not a problem, you can definitely start here. But I’m warning you, you’ll want to go back and get it once you’re done with Journey's Edge. Oh, and there’s a number three in this series too! Journey’s Embrace comes out next and you can check it out on Dora’s website. Stop by and tell her I said ‘HI’. Oh, and you can buy all of Dora's books right here or here. Oh my stars, Susan! You have me blubbering in front of my laptop. What an AWESOME review! Thank you so much! Off in search of tissues, but I'll be back. Ooh, this sounds like a good read! Adding it to the ever-growing TBR list. :) Thanks for the review, Susan! Dora - you're welcome:)I gotta say, your first book was one of my favorite reads last summer, and I wondered if you'd keep the pace up in this one. I really enjoyed it, Dora! Tempting review, Susan! It sounds like a great book! I'll have to look up. Thanks!